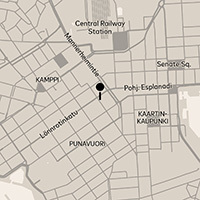 A new chapter in the history of Helsinki hotels has begun. Luxurious Hotel St. George opened on the 2nd of May, directly across from the beautiful Old Church Park in the heart of Helsinki. Hotel St. George redefines luxury and focuses on experiences. New chapters are being added to the story of St. George every day. The first chapter, written in spring was about the meaning of art. The second chapter is about food culture, encounters at restaurants, and the memorable experiences around it. Now it's time to reveal the chapter's heroes. What does the new luxury mean? Security, privacy, well-being, more serene life become values that are sought in the middle of the rush in different ways. What could this mean in the context of the hotel? Restaurant Andrea will open its doors at Lönnrotinkatu 4, Helsinki at the start of next year. Hotel St. George and Restaurant Andrea will offer food experiences together and independently, as separate concepts. Restaurant Andrea will be much more than a hotel restaurant. It’s time to write a new chapter in the history of Helsinki hotels. Hotel St. George challenges the traditions of hospitality, from its customs to its attitudes. The concept alone challenges the idea of luxury: Hotel St. George wants to offer its guests more, from moments of total wellbeing to unique, individual choices.